Israel is considering a “buffer zone” stretching ten miles into Syria “to protect itself from fundamentalist rebels on the other side of the border,” the Sunday Times reports. The proposal, which has been drawn up by the military and presented to Binyamin Netanyahu, the prime minister, is intended to secure the 47-mile border against a growing Islamist threat if President Bashar al-Assad’s embattled regime loses control of the area. The “Islamist threat” in Syria is funded and armed by the CIA and Saudi Arabia and Qatar. The Obama administration likes to pretend it is actively working to keep arms out of the hands of al-Qaeda in Syria, but the truth is something quite different – al-Qaeda and its affiliates play a key role in undermining the al-Assad regime. In addition to Israel’s “state sponsored terrorism” (as its bombing inside Syria was characterized by Turkish PM Recep Tayyip Erdogan), Israel has long used the Kurds to undermine not only Syria, but also Iran. 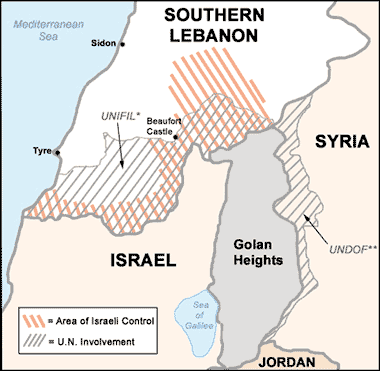 Israel’s decision to carve out a strip on the Syrian side of the Golan Heights – Syrian territory occupied and administered by Israel since 1967 – is hardly a new tactic: Israel did much the same in south Lebanon. 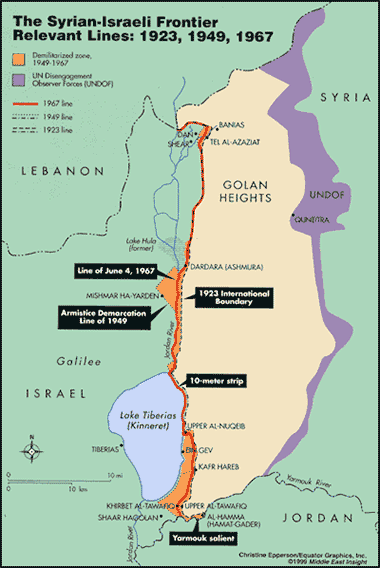 Following the conclusion of the 1982 Lebanon War and Operation Peace in Galilee (the Israeli invasion of Lebanon), the IDF was instructed by the Israeli government to maintain a “security zone” in Lebanon, ostensibly to prevent infiltration by the PLO. Israeli occupation of a 25 kilometer deep area inside the country and the brutality inflicted on civilians by the IDF and its proxy the South Lebanon Army resulted in the formation of Hezbollah. Around 18,000 people were killed and 30,000 injured and between 500,000-800,000 made homeless in the first three months of the Israeli occupation. The IDF maintained the notorious Khiam prison where many Lebanese were held without trial and tortured. Resistance by the Lebanese and Hezbollah’s low-intensity guerrilla warfare eventually resulted in Israel’s withdrawal from Lebanon. In 2000, Israel completed the withdrawal in compliance with UN Security Council Resolutions 425 and 426 requiring it to withdraw to internationally recognized borders. Livia Rokach, in her book on Sharett’s personal dairy, reveals a consistent effort by Israel to provoke Syria, beginning in the early 1950s and culminating in the occupation of the Golan in 1967, a move that resulted in the explusion of 130,000 Syrians. It is also about balkanizing and splintering the Arab and Muslim world, a plan not exclusive to Israel as a key component of its own territorial ambitions, but also used by the global elite who have employed the time-tested British “divide and conquer” strategy to “prevent collusion and maintain security dependence among the vassals, to keep tributaries pliant and protected, and to keep the barbarians from coming together,” as Zbigniew Brzezinski writes in The Grand Chessboard. “The purpose of the plan [to impose a buffer zone] is to ensure the safety of Israel’s Golan Heights and its northern region after the fall of the Assad regime in Syria,” Israel Defense reports today. “If the Syrian instability persists, it seems that IDF forces will have to stay in the security zone that will be constructed for years,” said one of those close to those behind the plan that was submitted. For Israel, the piecemeal conquest of Syria – and Lebanon before it – has little to do with “Syrian instability” manufactured in large part by external players (the CIA, Saudi Arabia and Qatar), but is rather an ongoing effort to dissolve Arab and Muslim states. Yinon described an effort to dissolve Lebanon, fragment Syria, go to war with Iran, target Iraq (mission accomplished), marginalize and weaken Egypt (now in process), undermine Saudi Arabia, and eventually depopulate the Occupied Territories. The decision to carve out a new security zone in Syria – despite its abject failure to maintain one in Lebanon – reveals that it remains on a trajectory envisioned prior to the establishment of the Israeli state. The United States will naturally support this violation of Syria’s national sovereignty – citing al-Qaeda and other manufactured threats – as it has supported nearly all of Israel’s efforts against its Arab and Muslim neighbors. Birds of a feather, they say, after all fly together.